Today is my fourth and final training dive for the TDI Decompression Procedures certification that I started earlier during spring... I am thrilled! Achieving this certification has been a long journey. To put some color to the story, let me give you a little background. After a family dive trip to Cozumel in Jan 08, I had 86 dives under my belt (since my OW Jul 07) and had the urge to start learning new things. In March, I was heading to Jacksonville FL for a business trip and looked for diving spots nearby. I was suggested by an instructor at the LDS to consider Ginnie Springs. Since I did not find a buddy for the weekend, I decided to go for a Cavern class. This was a life changing experience.... First, Cavern was the hardest diving class I had had so far; second, it opened a new whole new world of technical diving to me. After my cavern class back in March (see my blog for details), I decided that I would learn how to dive with double cylinders and train myself in technical diving. I came back all excited and started looking around for Tec classes and new gears. 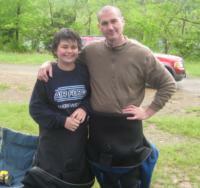 Discussed with KevinD, who had suggested Ginnie, whom kindly agreed to get me started in Tec diving. I started with TDI Advanced Nitrox and Decompression procedure theory classes. That was the easy part for me. I got my new rig and doubles filled with Nitrox and went 20 miles offshore Murell’s Inlet for a few deep dives where I manage to almost drown myself. On third dive of the first day, I empty those two cylinders and had to swim back 200 yds to the boat without air, with 3-4ft surges splashing in my face. It was a hell of an experience. It is easy to panic, but I manage to control the stress/fear and today I’m writing this blog. I thought running out of air could not happen to me... Next day and every day thereafter, I have been much more prudent when diving. Make sure you always have air when you surface, it’s much easier... That sometime means you may have to call the dive with a third of your cylinders full. After completing the Adv Nitrox training dives, I started to learn to dive again (with those heavy double cylinders and a wing). That was 60 dives ago. Since April, I practiced skills and procedures whenever I got a chance in the pool or at the quarry. I learned how to manage gas and isolate failure under water, control my buoyancy with stage and deco bottles, practice air sharing numerous time, plan properly my dives (and the std contingency planning) and dive the plan. Today, I finally completed the fourth and final training dive for the TDI Decompression Procedures. It was 1h20 dive, with 10 mins of deco. We spent 55 mins at 80-90 feet, 15 mins at 40 and 10 mins of deco at 10ft. 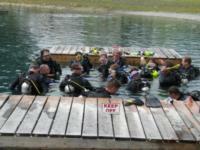 Final thought: If, like me at first, you think that Tec diving is cool because it allows you to go deeper; Think again. There are many safety reasons why Rec diving limit is 130ft and no deco.Unless you are willing to invest serious time, money and take additional risk, Tec diving may not be for you. For me, it has become a passion; the activity I’m thinking about when I’m not working or caring for my family.